Separation of polymers by more than MwTGIC introduces the concept of a temperature gradient into the sphere of liquid chromatography. 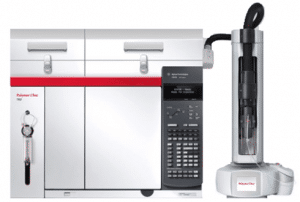 By modifying a typical HPLC instrument with a temperature-programable column oven, TGIC takes advantage of the thermodynamic interactions between a chromatographic column stationary phase and a polymer sample to allow separation of mixed species. Compared to size exclusion techniques, TGIC offers improved sensitivity, lower band broadening, and the other advantages of interaction chromatography techniques. Furthermore, TGIC presents an isocratic methodology, which allows for a wider range of detectors to be used, such as refractive index or light scattering. TGIC allows for Separation of polymers by more than Mw, resolving differences in features such as rings, branching, functionality, and block co-polymers. While crystallization techniques offer marginally better resolution, TGIC possesses a larger degree of flexibility in analyzing polymers with more significant amorphous components and does not suffer from co-crystallization effects.